According to Srimad Bhagavatam, Dhanvantari, the Divine Physician and the Archetype of Medicine is the incarnation of preserver archetype Vishnu. The scripture says that during the churning of the Cosmic Ocean of Milk, Dhanvantri emerged holding the pot of eternal Amrita (elixir of immortality), Shankh (Conch), Chakra (Sudharshana Chakra) and Jalauka (leech) in his four hands. He is considered as one of the 14 treasures from the Cosmic Ocean of Milk and the Lord of Ayurveda. 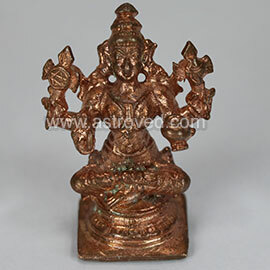 His mantra is primarily chanted for good health and longevity. Chanting the Five Hymns of Praise (Three for Vishnu, One for Lakshmi and One for Durga) along with Sahasranama, the 1008 names of the Supreme universal preserver archetype Vishnu, can create an invisible protection ring that safeguards your health and wellbeing. Why is Dhanvantri Homa and Pancha Suktam Chanting Essential? Performing this powerful ceremony every year can lessen your health problems and reduce the impact of all your diseases. If performed or participated with complete faith, it is believed that this homa has the divine power to possibly remove your diseases and sufferings. Performed by experienced Vedic priests, it is believed that this homa is auspicious to confer the protective shield of the Lord of Ayurveda and the preserver of the three worlds who is empowered to remove fears and diseases. As per the sacred texts, you can experience the below list of benefits by participating in this 5-priest grand fire ceremony. Participate in the unique 5-Priest Grand Group Dhanvantri Homa with Pancha Suktam & Sahasranama Chanting to invoke the blessings of Dhanvantri for health and longevity for you and your loved ones. We have also arranged for special archanas (light and sound ceremonies) at powerful powerspots and on your behalf, we are also donating medicines to the sick and needy. As a remembrance of your participation in the unique homa, we ship a complimentary 2-inch Dhanvantri statue. You will receive the complimentary 2-inch Dhanvantri statue along with sacred grey ash powder from the homa and kum-kum (Red Vermillion Powder), which will be blessed in the rituals. Keep this on your meditation altar and wear it on your forehead during meditation or at other times to expand the Divine blessings into your life. Please Note: Your complimentary 2-inch Dhanvantri statue and Prasad will be shipped from Chennai, Tamil Nadu. Please allow 2 – 4 weeks for delivery after the entire set of rituals is performed. We are recommending you to take this personalized 30 minutes astrology consultation with our astrologer who is specialized in giving health consultations. You get a personalized predictions based on your birth chart and placements of the planets influencing your health and wellbeing. In case of any additional details about this service, kindly get in touch with our customer support team.